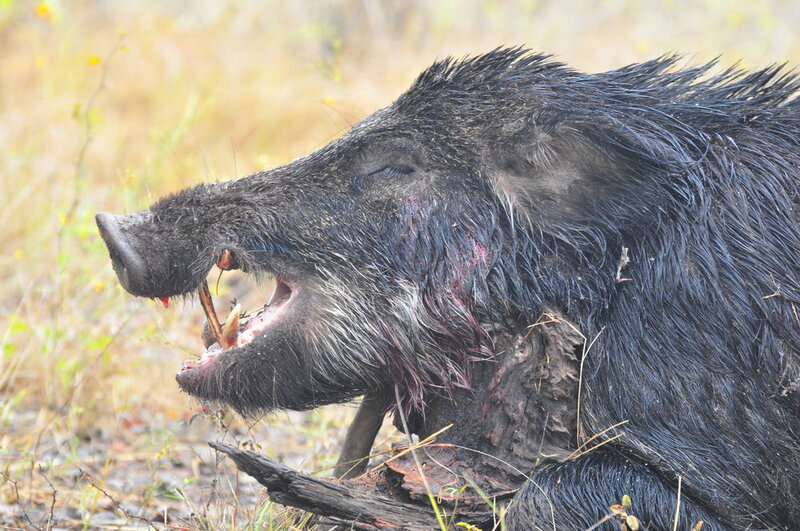 The challenging pursuit of wild hogs in the Great State of Texas is a tremendous amount of fun with fantastic appeal to hunters regardless of your skill level. Hunting wild hogs is fun and challenging. 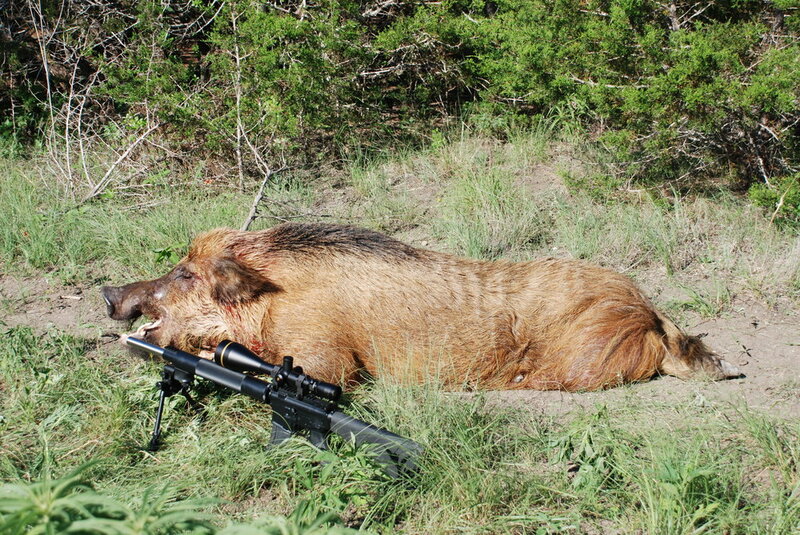 It’s no wonder that most of our hunters find themselves addicted to Texas wild hog hunting! All hog hunts are booked for 2 days hunting, 2 days lodging and by the end of the hunt you should have a cooler full of pork to ice down for your travel home. Wild Hog Meat is Excellent Table Fare. At KVR, we’re not sure where or how the rumor started that wild hog meat is inedible. Perhaps all wild game back straps are inedible? People, this is simply not true. All wild hogs can be eaten regardless the size! It’s a wonderfully lean meat that’s great to use in anything from breakfast tacos to gourmet pork roast. You can grill it, smoke it, slow cook it, cook it in a pit, crock pot it, or have it ground up for sausage…any way you choose to cook your wild hog will give you a tasty as well as healthy meat. Our favorite way to cook wild hogs at the ranch is to smoke it whole with low heat on our big Texas-sized smoker. 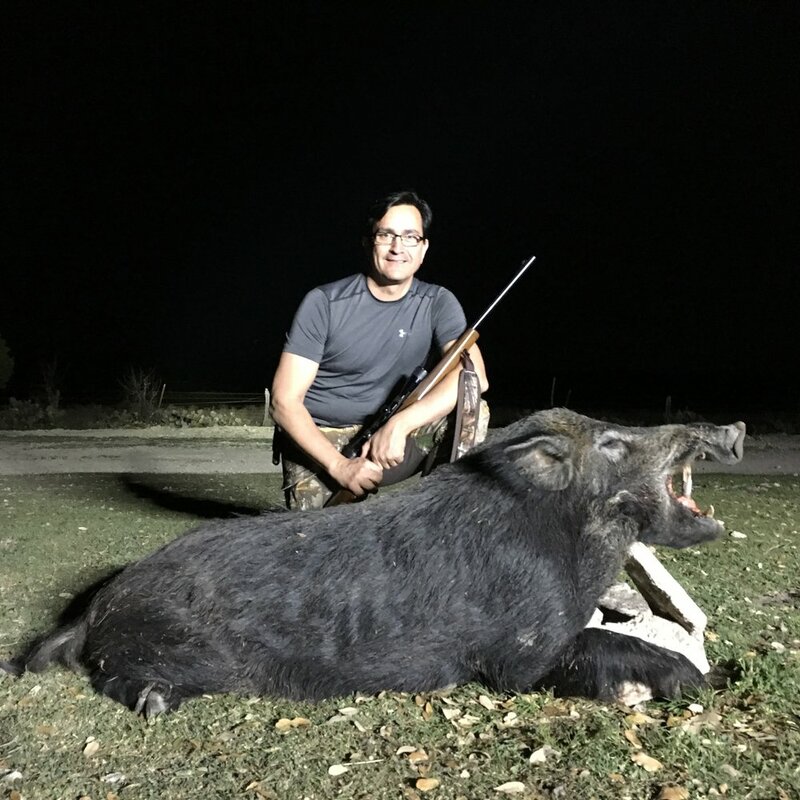 Hunter’s that have booked a weekend hog hunt at the KVR typically arrive at the ranch between 4pm and 9pm on the Friday night before their hog hunt begins. After settling into the Hunter’s Cabin we head over to the office to go over the KVR safety rules, hunting guidelines, and sign your liability release form. We also require that you watch the mandatory KVR safety video. After completing the safety briefing and appropriate sign in, we will gather up your rifle/pistol and head to the KVR range to check functionality and accuracy. After sighting in your weapon, most of our hunters’ head over to the campfire ring to enjoy the evening telling stories and hanging out with folks that share similar interests. Your hog hunting begins early the next morning when we take you to your hunting blind. Each hunter is provided a radio for communication and a designated time for pickup. Lunch will depend on what package you purchased. If you didn’t purchase meals, you can either cook meals on the pit, heat something in the microwave, or drive a few miles into town for a meal at one of the local restaurants. For the competitive types we offer a friendly game of horseshoes, redneck golf, dominoes, or darts. Perhaps a few hands of poker at the KVR card table? 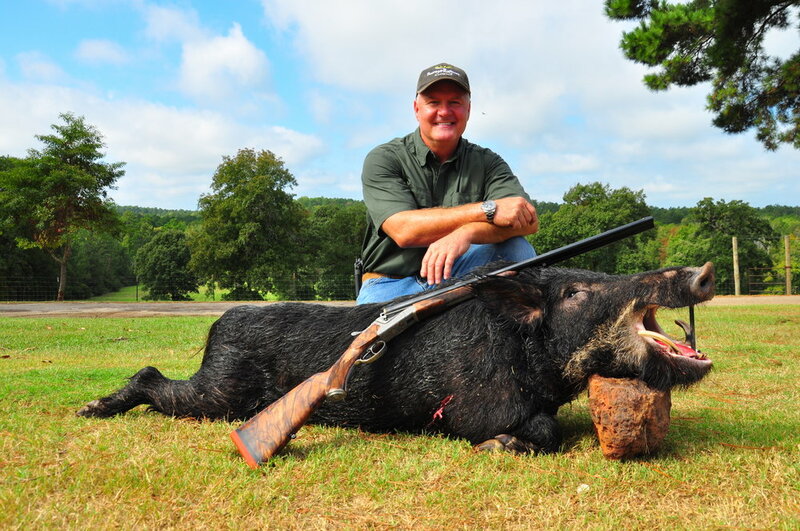 The evening hog hunt is typically when most of the action happens. 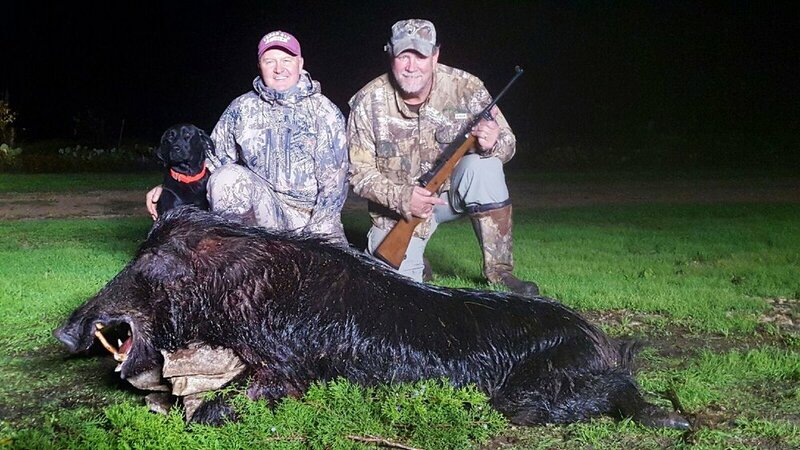 Hog hunting in Texas can get very active in the evening and it’s a hoot hearing the stories when we pick up everyone up at dark. Wild hogs are loud and active! All hog hunts are booked for 2 days hunting, 2 days lodging and by the end of the hunt you should have a cooler full of pork to ice down for your travel home. The entire KVR staff wants you to have a successful hunt and enjoy a unique outdoor opportunity while hog hunting at the ranch. Hog hunting at the KVR is all about making memories and spending quality time with family and friends. 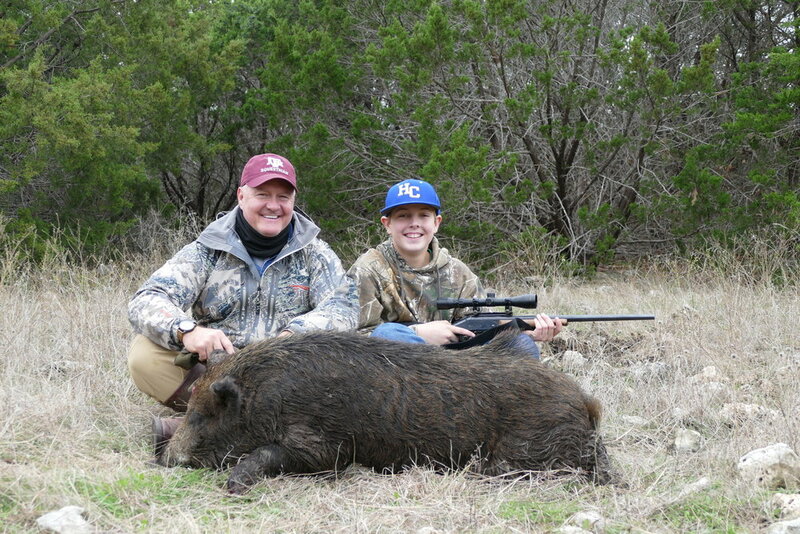 Wild hog hunting is truly an affordable hunt for all ages and experience levels. 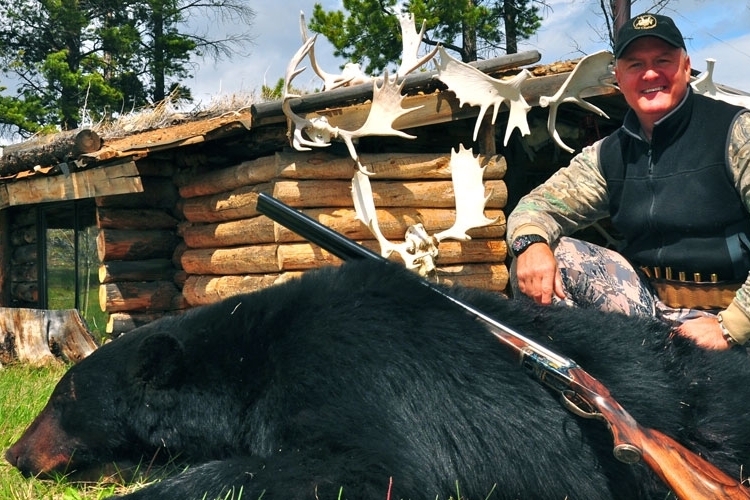 With scarce public land open to hunting, there simply aren’t a lot of places left where a hunter can go on a 2-day hunt for less than $500 a person. No Seasonal Restrictions on Wild Hogs. 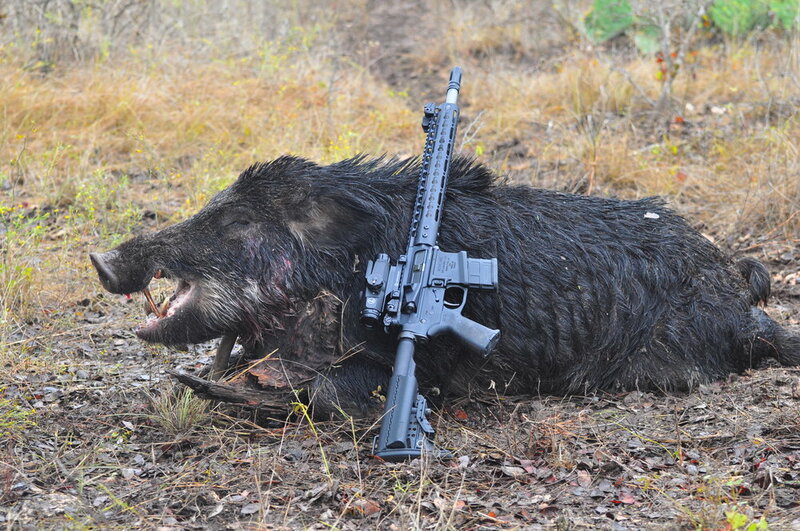 So, Wild Hogs can be hunted year round in the Great State of Texas. 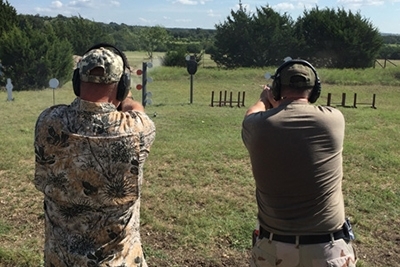 All you need is an inexpensive non-resident hunting license. For the do-it yourself types we give you the option of skinning out your own hog or you can have the ranch manager skin and quarter for $25-$50 depending on the size of the hog. We skin and quarter tons of animals each year and will get your hog ready for the cooler in no time at all so don’t feel like you must do it yourself. Your weapon – We have a lighted range to check functionality and accuracy of your weapon. We have a 3D archery range to check your bow. Camouflage – Yep, if you plan on hunting from a group blind or a traditional ladder blind you will need to wear camo. Your Personal Items – You’ll need basic toiletries such as soap, toothbrush, toothpaste, etc. We provide the basic linens such as sheets, towels, pillows and blankets. Flashlight & Headlamp – Bring the best flashlight you can afford along with a headlamp. If we need to track a hog you’ll be glad you did! Skinning knives – Only if you choose to do-it-yourself. I don’t recommend doing it yourself when you can have it done quickly for a minimal fee. Ice Chest – We have a very high success rate so you will likely leave the ranch with a cooler full of wild hog meat. Trash Bags – To put your meat into after it’s skinned and quartered. A few extra bags for dirty clothes is always a good idea.